TODAY’S TIP: SAY NO TO HIGH SUGAR “HYDRATING” DRINKS – LATER GATOR-ADE! Hydration is essential to performance, safety and comfort during exercise. If it’s hard, long and intense, the more important it is to drink the proper fluids! Dehydration decreases your performance. Sweating will drop your blood volume which can cause the heart to work over time to circulate blood. These drops in volume lead to muscle cramping, dizziness, fatigue and heat exhaustion. Sport drinks are UNNECESSARY for anyone who is not training for a marathon or Ironman. It is impossible to deplete your body’s stores of sodium, potassium and other electrolytes during normal training. So if you are someone who is justifying drinking these high sugar drinks just because you are “hydrating” it is time to stop. This is not helping your body OR your waistline. If you have a fondness for fructose then try these simple solutions in a glass ( not plastic ) of purified or distilled, fluoride-free drinking water. Try a sprig of fresh mint with organic sliced strawberries. The oils in mint will aid in proper digestion, freshen breath and give you a glowing complexion and strawberries are sweet but very low in natural sugar. Or maybe organic cucumbers and lemons. 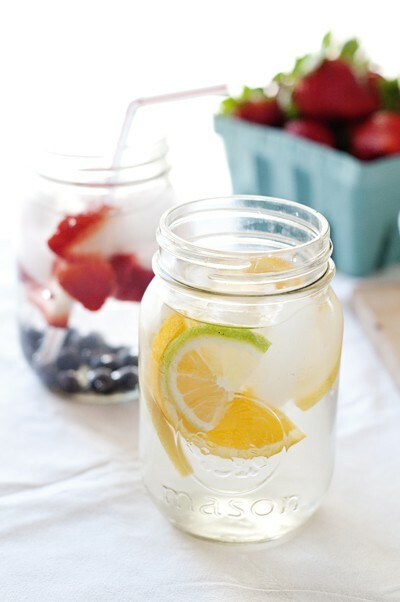 Lemons in your water will burn extra calories just buy drinking it! Use sliced organic oranges and lime for a liberating libation. These are some of my favorite low sugar, complexion friendly mixes… so drink responsibly!